In our house, an hour north of New York City, we mark the seasons with extreme weather: the spring thunderstorm that felled our century-old maple; the summer hurricane that knocked out our power and flooded our basement; the Halloween blizzard that collapsed our fence; the summer heat wave that killed our sweet corn crop; and the fall "superstorm" that tore away part of our back porch and—infinitely more painful than any of this—took the lives of two young boys in our town. All of this in the past 18 months. 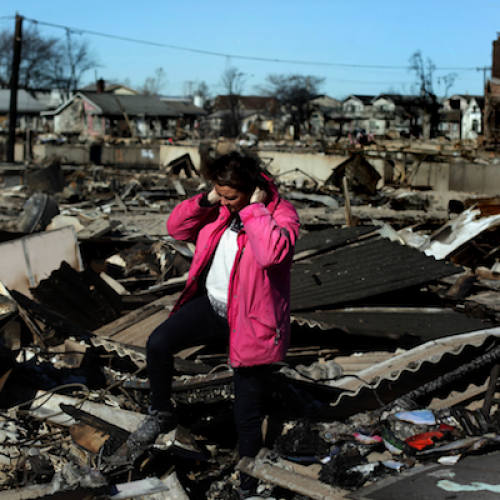 Sandy was one of the most destructive storms in American history. The best science tells us that global warming fed her fury. It helped heat the Atlantic waters, increasing her energy. It loaded the atmosphere with additional moisture, boosting her rainfall. And it raised the sea level in New York Harbor, adding to her record storm surge. Climate change makes hurricanes badder and bigger as surely as doping made Lance Armstrong ride farther and faster. So will Sandy put an end to our political leaders' silence on climate change? I thought we had already answered that question. In 2006, an even deadlier storm, Katrina, helped shift the conversation from science to politics, from whether anthropogenic global warming was real to what we were going to do about it. In response, I decided to devote three years to a book about climate politics. When I began work on The Climate War, in early 2007, I thought I would be telling the story of how we finally started to get serious about reducing emissions, by passing a mandatory, declining carbon cap. I ended up telling the story of how we failed. There were plenty of culprits: the financial crisis and the Great Recession; a president who promised to drive climate legislation but chose other priorities; a news media that mostly missed the biggest story of the era; a fossil fuel industry that spent (and continues to spend) hundreds of millions of dollars a year on politicians, lobbyists, and misleading ads; and finally, elected officials from both parties who concluded that silence was better politics than solutions. The only entity with the moral authority to call the politicians to their duty—the American public—was also disengaged from the fight. Environmentalists had limited success getting broader communities involved, in part because the problem seemed so much more distant and abstract than the economic troubles that were keeping people up at night. The relatively small portion of the population that pays attention to policy debates never grasped the stakes of this one. The argument was distorted by post-crash economic anxiety and the rise of the Tea Party. As a result, “cap and trade” became "cap and tax" and the issue was framed as being about the imposition of new costs, rather than about the larger costs that would come from doing nothing. The climate campaign of 2009-10 was reduced to a top-down strategy—the attempt to pick off enough Republicans to jam the bill through. With the White House and both houses of Congress in (narrow) Democratic hands, it was worth a shot. But energy votes turn on geology as much as ideology. In extraction states, Democrats and Republics alike were uneasy about the climate bill. Every landmark piece of environmental legislation in U.S. history has passed with overwhelming bipartisan majorities, and the climate bill failed to become an exception to that rule. It squeaked through the House but was dead on arrival in the Senate. And with that, climate change vanished. Most news outlets basically stopped covering it. This year, for the first time since 1988, it wasn't mentioned in any of the presidential or vice-presidential debates. A year after the climate bill died, I decided to get off the sidelines. I took a job at Environmental Defense Fund and—along with many others—started thinking about how to restart the discussion. I traveled in the Midwest, meeting with people who don't trust environmentalists; they thought coastal elites had been trying to cram something vile down their throats. To be successful, the next climate campaign will have to be more bipartisan, more inclusive, and more bottom-up, with people from both sides of the aisle competing to provide the best ideas. But let's be honest—it has been hard to see how that would happen as long as one of the two national parties declines to recognize the problem or participate in the debate. But now there’s Sandy, and suddenly Chris Christie was standing with President Obama on the wrecked shore, because the New Jersey Governor had "bigger fish to fry" than the election. After a year of extreme heat, drought, floods, and storms that were almost never explicitly connected to climate change, at least not in the media or by politicians, that silence is beginning to crumble. Bill Clinton made the first noise. On Tuesday, the former president said: "All up and down the East Coast, there are mayors, many of them Republicans, who are being told: 'You've got to move these houses back away from the ocean. You've got to lift them up. Climate change is going to raise the water levels on a permanent basis. If you want your town insured, you have to do this." That evening on the NBC Nightly News, anchor Brian Williams offered a tentative linkage of his own: "People are raising global warming already. "Soon New York Governor Andrew Cuomo and newspapers across the country were asking what our coastal cities need to do to prepare for rising seas and wilder storms, and how much will it cost. The answer is, a lot. Sea gates to protect New York Harbor from storm surges could cost $10 billion. (London already has them.) But doing nothing would be far more expensive. Sandy's price tag is estimated at $50 billion. Last year, some $26 billion was paid out in insurance damages for thunderstorms alone. Drought-induced crop failures have sent commodities prices soaring. And the German reinsurance company Munich Re released a report last month that found the rate of extreme weather events rising globally, but “nowhere in the world is the rising number of natural catastrophes more evident than in North America.” From 1980 through 2011, weather disasters caused losses totaling $1.06 trillion. Compare that that to the cost of tackling the problem. The best nonpartisan academic analyses of the carbon cap estimate that by 2030 it would shave just 0.58 percent, or $133 billion, from the U.S. G.D.P. For the first time, the climate debate, once focused on the cost of action, is taking into account the cost of inaction. As Bloomberg Businessweek said on the cover of this week’s issue, "It’s Global Warming, Stupid." Then the magazine's owner endorsed Obama, saying Sandy "should be enough to compel all elected leaders to take immediate action" on climate change. That's a sentiment I've been hearing from people I hadn't expected to feel that way. Early this year in southern Indiana, I met a utility lineman who spends his days outside. He was a conservative man, but weird weather had grabbed his attention. "It isn't like it used to be," he told me. "It's hotter and the storms are much scarier —we all know that." The polls bear him out. According to the Yale Project on Climate Change Communication, a majority of Americans now believes global warming has intensified the record-setting extreme weather events of the past two years. It would be easy to overstate the significance of this moment. Sandy might mark the beginning of an important shift in the political dynamic—but that will only happen if the conversation that started this week is given steady attention, not one brief spasm after a horrendous storm. A great many people have been hiding from this issue for the last couple of years—elected officials, civic and business leaders, journalists, folks who were just tired of arguing about it. It's time for them to speak up. If the Indiana lineman and so many others like him keep talking the way they have, if local officials and grassroots activists and faith leaders and business people and first responders and insurance agents all join in, politicians from both parties will conclude that it is to their political advantage to talk about climate change as well. If we demand it, our leaders will have to follow. Pooley, a former managing editor of Fortune and chief political correspondent for Time, is senior vice president at Environmental Defense Fund and the author of The Climate War: True Believers, Power Brokers, and the Fight to Save the Earth.